This isn’t the first time we see the 2018 Mercedes-Benz X-Class, but the spotted pickup truck definitely wears a production-ready design. Yes, the vehicle is still totally wrapped, yet the thin camouflage doesn’t hide anything at all. 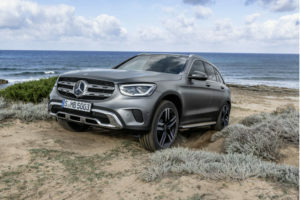 As you may notice, Mercedes’ X-Class pickup sports an aggressive front-end styling with production-ready headlights and standard LED daytime running lights. In addition, there is an impressive mesh grille and pretty interesting and highly dynamic hood. Around back, the interesting truck also features the production-ready stuff, like the unique taillights and bumper. 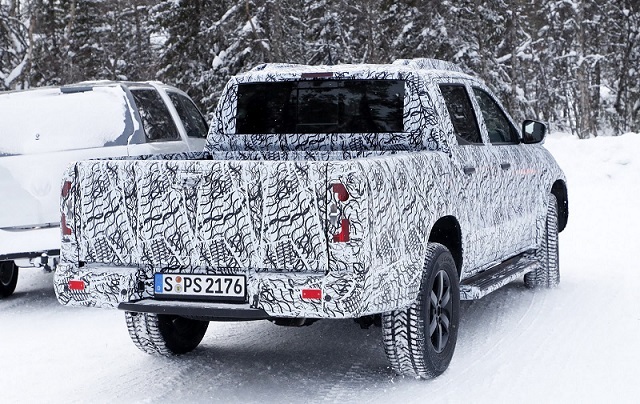 On the other hand, the prototype of the 2018 Mercedes-Benz X-Class currently hides its exhaust layout. However, the most interesting detail, or better to say details are two fuel caps, one on each side. We are not sure what’s going on, but there is a chance to see either two-tank layout or some kind of a plug-in hybrid powertrain. 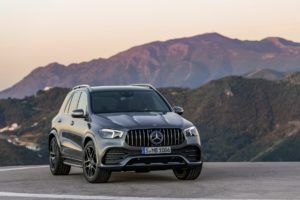 Mercedes’ all-new truck shares its bones with the current Nissan Navara and Renault Alaskan, but it’s also essentially different from these two. Unlike its platform siblings, the 2018 Mercedes-Benz X-Class has a multi-link rear suspension, coil springs, and active dampers. These features will significantly boost pickup’s ride quality without any doubt. The base model will likely use a rear-wheel drive system, but there will be an optional AWD. We can’t really say whether the carmaker actually prepares any kind of hybrid, yet on the other hand, the pickup truck will definitely get a range of four-cylinder units and several V6 mills. Of course, the carmaker won’t skip the chance to add concept’s turbodiesel V6 engine, which will be able to tow up to 7,000 lbs. 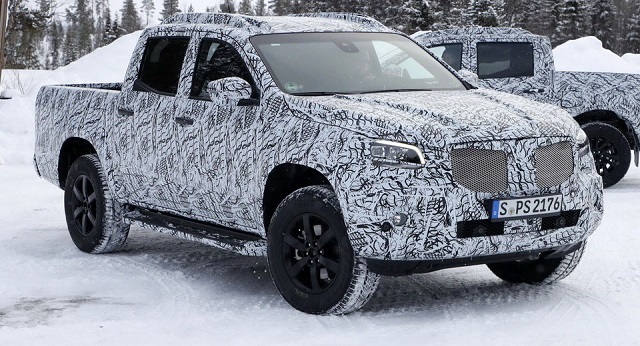 Judging by the information we have, the 2018 Mercedes X-Class will be introduced at the 2017 Frankfurt Motor Show. However, the manufacturer won’t release the pickup truck before early 2018.